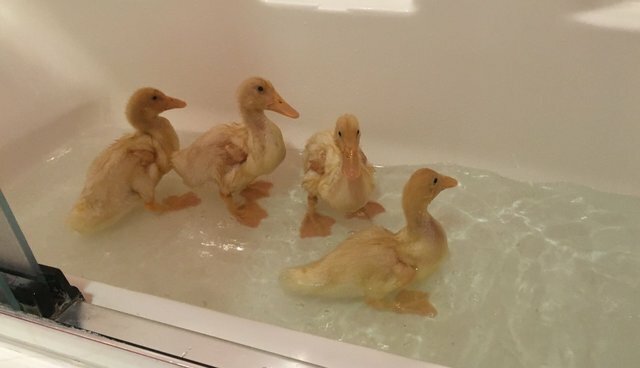 After being used as Easter decorations and toys for children, four ducklings were left outside without food, water or shelter. 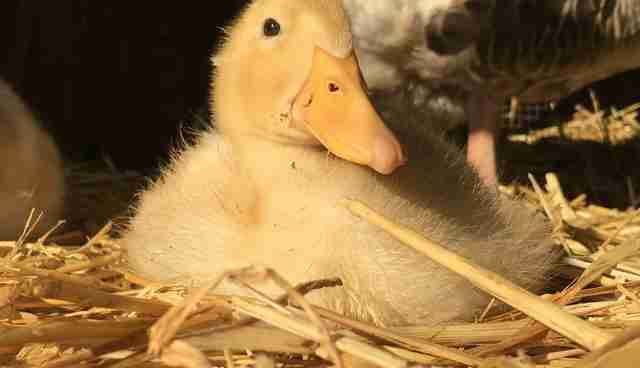 Luckily, a woman spotted the abandoned ducklings, and snuck them into her car, taking them to a local rescue group. 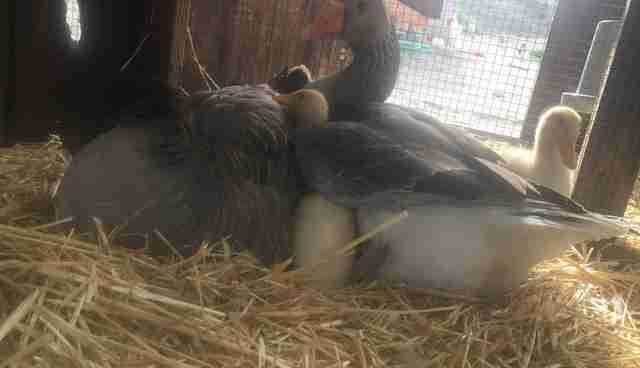 Now the four ducklings are in the care of Zoe Rosenberg, a 13-year-old girl who founded Happy Hen Chicken Rescue in California two years ago, when Rosenberg was only 11. The group mainly rescues chickens, but when Rosenberg heard about the plight of these ducklings, she opened her arms to them. Shortly after their arrival, Rosenberg gave these four babies a bath, which they clearly enjoyed! If the ducklings had been raised in the wild, they'd spend the majority of their day swimming with their mother, and learning how to fly and find food. "To them, swimming feels just as natural as walking," Rosenberg tells The Dodo. "I think their bath yesterday was the highlight of their weekend." But ducklings need more than water to be happy - they also need love. While Rosenberg is giving the ducklings as much attention as she possibly can, she knew these ducklings - who are only about 3 weeks old - would need special care. 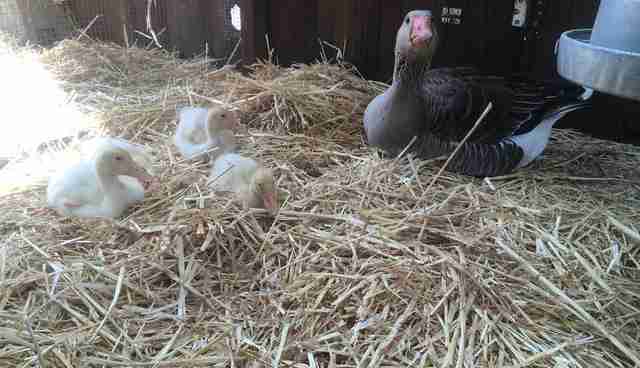 So Rosenberg hatched a plan: She'd introduce the ducklings to a couple of female geese living at the sanctuary. 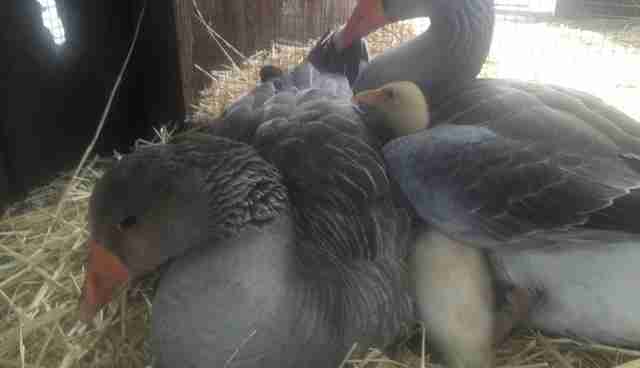 "We brought the two ducklings down and the geese immediately became excited when they heard the peeping," Rosenberg tells The Dodo. "The geese seemed sure that they wanted to take care of the ducklings right away! The ducklings were a little nervous at first, but they realized they were okay pretty quickly. Even though it's not quite the same as having parents of the same species, I think the ducklings are really glad to be with the geese." Animals like ducklings, chickens, goslings and rabbits are often bought on impulse around Easter to be used as decorations in "live Easter baskets." After the holidays, however, the animals tend to be dumped at local shelters, or simply left outside. "People think they're doing a good thing by 'letting them go,' even though they're orphaned babies and domestic, and would have trouble surviving in the wild," Rosenberg explains. If the released animals do happen to survive in the wild, they can often harm wildlife. According to Karen Benzel of the International Bird Rescue Research Center, domestic ducks and geese can mate with wild waterfowl, creating hybrids that will weaken the gene pool of wild birds. Happy Hen Chicken Rescue plans to build a duck pond for the ducklings so they can swim as much as they want each day. To help make this happen, you can donate here.